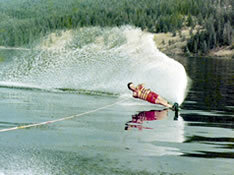 The BoatingKelowna.com website has been developed by a passionate outdoor enthusiast, Kit Crowe. While Kit lived in Vancouver, BC as a youth, his family had fallen in love with the Okanagan in the 1950s and purchased a lakefront vacation property there. So his summer holidays were spent having fun in the water, boating, waterskiing, sailing, fishing and swimming. On land Kit enjoyed dirt biking, hiking and biking. Kit has sailed throughout Hawaii and crossed the Pacific Ocean back in 1980. To this day, he savours his boating time spent on the water with family and friends. As a youth, one of Kit’s first summer employers was a local Kelowna marine dealership. To this day Kit continues to work in industries that fuel his passion for life and the outdoors, including (in his past) sporting goods (both wholesale and retail), and the marine business. Kit has now made Kelowna his permanent home for over the past two decades and wants to share his love of the city and and all the nearby lakes have to offer.